So it’s not often Movies Galore gets requests to do reviews but I’m happy to supply an opinion if I can. In Act 2, Emma comes up out of her shelter and ends up having a scuffle with a rotten. I think I like the idea that they are being called a Rotten instead of a zombie and everytime a rotten is around you know because it’s in black and white then it goes back to color. meanwhile Jebediah thinks that Glenn left them and the rest of the camp to the rotten by locking them out. Emma is then seen driving a pickup into town to get her father to a hospital. a band of misfits that seem to be part of a carnival in fact I believe the little guy in the top hat is or was in American Horror Story:Freakshow as Meep and Infantata. As well as Irwin Keyes who plays the Giant whose played in many recurring roles including a role on The Jeffersons whom is now deceased as of July 8th 2015 R.I.P. After Jebediah in the end of act 2 continues to fuel his mistrust of Glenn being behind the bad things happening in Act 3 we see Emma continue on her journey to find Dr. Emerson to help her pa. Played by a different actress this time Emma is walking along side a young African American named Skinny as they talk about their different experiences him saying it hit the women first as they both got attacked by the Rottens. Now Jebediah and his goons are still after Emma and Glenn and have found out her location thinking Glenn was among them but not before the good doctor was about to tell Emma a key ingredient to a cure was with his trusty servant Rusty played by the same actor who played Zeke in the first act. After the kidnapping of Emma, Rusty, Skinny, and Dr. Emerson awaken feeling like they were that close to a cure while back in camp Emma is caged in her underwear to the watchful eye of Jebediah. Ultimately I think this was supposed to be a longer series and take off more than it did but sadly it just became a feature film but there is some great indie actors we see as well as some seasoned actors that we saw in bigger and greater parts either way earlier or later like Squeak as Meek in American Horror Story: Freakshow. If you’re in for a tale with freaks and Rottens your in for some definite comedy as well with some of the characters being a bit corny along with Jebediahs obsession with Glenn and his family before and after the infestation. as Bar Patron, Bryan Matthew Ward as Posse, Laura E. White as Bar Patron. So what led me to this director? None other than the Brazilian anthology As Fabulas Negras aka The Black Fables for his segment “Blood Bond.” Which won three awards in 70 festivals and twenty countries. Produced by his own company RZP Films along with working with Rodrigo Aragio on Effects Caetano plays a man apparently infatuated with witchcraft and the dark arts. After performing some kind of ritual this man wide eyed gets startled as if someone is watching him. The man runs outside all the while paranoid looking behind him as if something is following him. No matter where he goes though he isn’t safe… What kind of evil did he conjure up? for 7 minutes this entertained me though I wish there might of been some talking I don’t think now that it’s needed. It was very quick and to the point and to make the man into the demony shadowish type creature was pretty cool. Great job to the special effects and how demonic you looked Joel way to go! 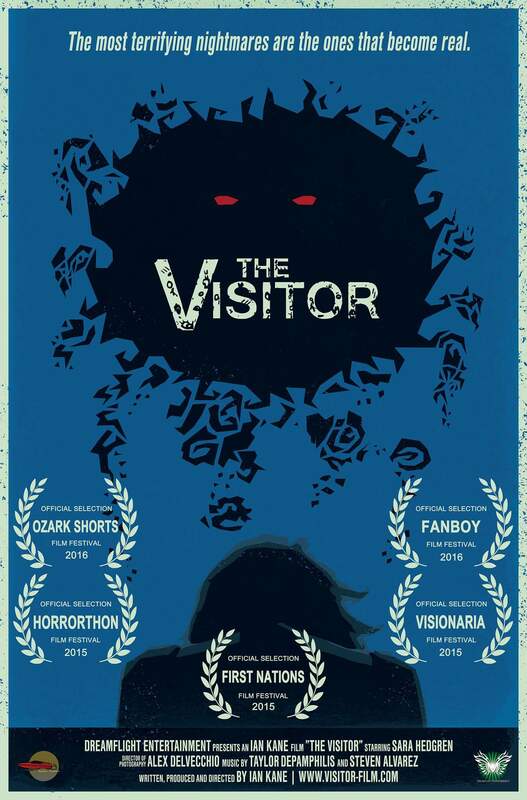 i recommend for all horror fans to check this out was a pleasure. To be honest I’m still fairly new to the short film scene but from what I’ve seen of it all I’m loving every minute of it. Last year or summer Milwaukee Movie Talks Chris House and Stephen Milek invited me along to two of the local festivals. After From the Darkness Theater he aspired to direct this short film in 2013 with Milwaukee Film and Collaborative Cinema. A fisherman is out in a great expanse of water he is sad pulls into what looks like an island coast after not catching anything. i think I enjoyed the simplicity of this film for this speaks of another loss one that time never seems to fail to remind some of us. The loss of time. Some time we can get so busy with moving up with our careers the we forget the simple acts of our loved ones that tend to be ignored or forgotten over time. you could see this man was heartbroken by the time that was lost. i recommend you see this film if you haven’t. I’ll let the next viewer decide whether they like it or not. Enjoy! Brought to us by Milwaukee director Nelson Oliveras with T.O. Media Films from 2014 this is his second film as Once an Afternoon was his first . We see Tom sitting on a river bank deeply thinking… As the film starts. Tom keeps having flashbacks of what we don’t know but we slowly learn that his wife Sally was either texting or talking on the phone, son Gabriel in the car, son in a coma then told that son died due to too much brain trauma. All of this was being told to a pschiatrist as to how things were going at home. Ultimately I think this has two morals one that you don’t text and drive and two no matter how you try to help someone sometimes the bad ends up happening reguardless the advice being given. I will let the viewer decide though enjoy! Starring William Cairns as Tom, Ricardo de Herrera as Psychiatrist, Daniel Hass as Josh, Elizabeth Havican as Sally. I first met Tony at the Milwaukee Short Film Festival for his A Dubious Night Short Film. Turns out he knows my Aunt and so did the writer Mark. Being as this was his first film Nelson Oliveras a local Milwaukee film maker teamed his T.O. Media with Psycho Boots Productions as well as 2 Much Movement Studios to film this 2013 film. But I wouldn’t be doing him justice if I didn’t review his previous efforts as well. As the film begins we see two men one driving one riding all dressed in black. The older man and younger are talking back and forth about a job we find out the older mans name is Bill, younger man Ryan they arrive at a destination. Again this wasn’t what I originally expected the outcome of the film. The film starts out with a convoluted conversation between a hit man and his underling protege. Then turns out to have more mystery. I personally want to see more of this is the future. I will also remember the eyes of the one lead goon I know he wasn’t wearing any glowing contacts or anything of this nature but they were very distinct. I’ll leave it up to the viewer to decide whether they enjoy this roughly about 11 minute short. Enjoy! Starring Allison Chicorel as Ellie, Daniel Hass as Ryan, Matthew Nichols as Bill Jayden Erdem as Toby, Jezse Galan as Under Boss, Luis Matos as Goon. Movies Galore Stops in at “Papa Primo’s Apocalyptic Pizza” a short film directed by Bill Robertson from 2016! You know this is why I started enjoying short films you never know what your going to expect but I have a tasty little treat for you from Cygnafilms Bill Robertson from 2016. So basically the title says what in the film but I’ll give ya a synopsis. Papa Primo is preparing a pizza when he gets a phone order and drops his dough… in walks a stammering hooded figure while a skinny young man looking like Melvin the Mop Boy, runs by outside away from some undead zombies only looking for dinner. You can see the comedy start to be portrayed half way in and as its a short film I could see it as being a snippet to a larger film based around characters dealing with or around the pizza parlor. I also like the Italian music flair of music behind the film. Gives it an old fashioned sense of clarity than if you put punk music or rock. So ultimately I liked it in the end and want to see more. I’ll leave that up to you the viewer and hope that others enjoy it too enjoy! Starring Andrew Confair as Papa Primo, Kevin Lepka as Dennis The Delivery Boy, Scott Geiter as The Doomed Figure, Richard Lawson as The Bearded Zombie, Chris Beacon as the Bald Zombie, Nathan Maldonado as the Security Guard, Zina Michelle Martin as the Blonde. Bright to us by Ian Kane of Dreamflight Entertainment that brought us Shades of Rememberance is this delightfully creepy short film from 2016. I’ll leave it up to the viewer to decide though on weather you enjoy this film it’s not up to me to tell you to like a film or dislike enjoy! Starring Sara Hedgren as Hanna, Ian Kane as The Entity.